Mayceys Glohearts - SANZA packed from bulk. Glucose Syrup, Sugar, Water, Gelatine, Acid Modified Maize Starch (E1401), Flavour, Colour (E123). 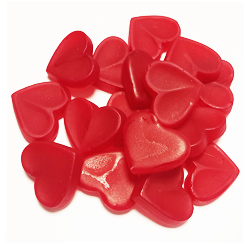 There is something indefinable about the flavour of Maycey's Glohearts. It evokes a childhood memory that is elusive but comforting ... almost medicinal, with a sweet hint of cinnamon and aniseed and ... something else ... something that is recognisable at least to the palette but eludes definitive categorisation. If you haven't tried them - do so. They will surprise you with their comforting warmth and baffle you with their hints of something that stirs the memory but remains tantalisingly elusive. Used to buy these at the dairy on the way to school every monday morning,love them so much.